Kinetex textile composite flooring will perform in elevated RH slabs up to 95% using Kinetex Adhesive and up to 100% when using PreFix. The breathable nature of this product allows moisture to pass through the backing rather than trap it underneath. This method of vapor transmission allows Kinetex to be installed without costly moisture mitigation as long as the Relative Humidity Test reads 95% or below (100% using PreFix). 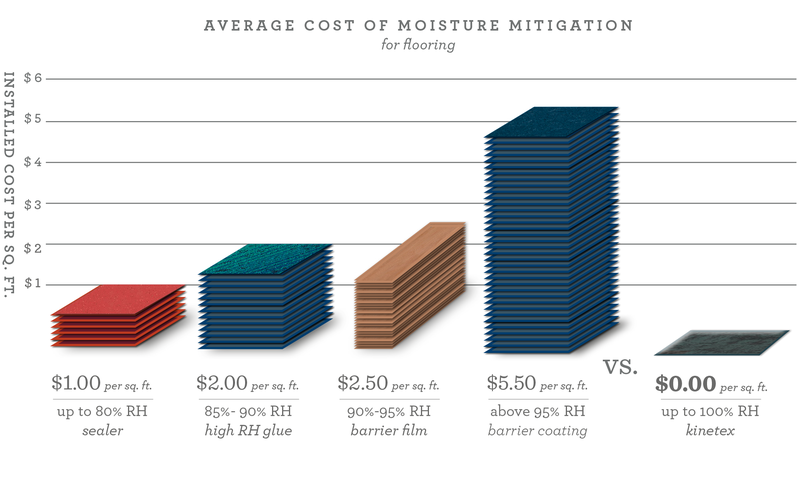 Mitigating excessive slab moisture can cost $5,500 for every 1,000 square feet — which adds up to millions of dollars annually for schools and colleges. Avoid costly moisture mitigation and schedule-breaking delays with award winning Kinetex textile composite flooring from J+J Flooring Group.